Nearby Colonial Parking garages are shown on the map. Some offer $6 parking for Smithsonian Associates events on weekday evenings after 5:30 p.m. and all day on Saturday and Sunday. Inquire before parking and be sure to have your event ticket with you. Parking lot hours vary. Starting June 22, 2017 metered parking ($2 per hour) will be in effect for parking spaces around the National Mall. Parking is available at the Holiday Inn garage (operated by Colonial Parking) accessed from 6th St. Flat rate of $6 for tour participants, you must have your ticket stub available upon leaving the garage. Please allow sufficient time to enter and park, as your car may be subject to a standard security inspection. Tentative parking and departure locations for specific tours are provided on the ticket and may be confirmed several days prior to each tour by calling the tour information line, 202-633-8687, and selecting menu item 2. 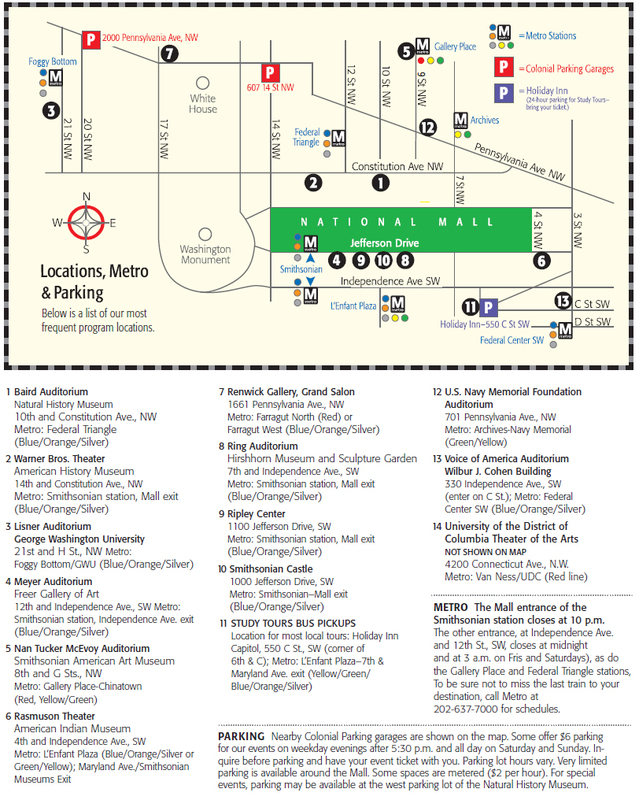 Parking at the Smithsonian is usually provided, on a space-available basis, for Smithsonian Associates members on weekend overnight tours. The location of such parking and nearby pickup stops is included in the special information mailed two weeks prior to each overnight tour. Please do not block other cars. Weekend overnight tours now usually depart from the Constitution Avenue entrance of American History.